'Saving civilization' was the grandiloquent cry of the 1920s and 1930s, This is a study of the various answers these three great modern British poets - Yeats, Eliot and Auden - gave to the question of how a 'mere writer' could affect the world of his audience. The author concentrates on the years between the wars, a time when the pressure to save civilization was felt by poets and political leaders alike. The book avoids the typical political labels associated with these poets, such as 'reactionary' or 'leftist'. Rather, it analyses the conflict the three felt between a civic urge to become engage and an artistic need to remain disengaged. Dr McDiarmid traces the story of the different ideals the poets formulated in response to the fragmentation and anxiety of the modern world. 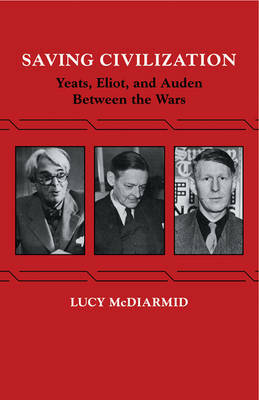 Yeats, Eliot and Auden experienced a simultaneous disillusionment over political goals and a triumphant rededication to artistic ones. Their realistic adjustments to the limiting conditions of the twentieth century are sensitively described in a work that has immediate interest and permanent value.